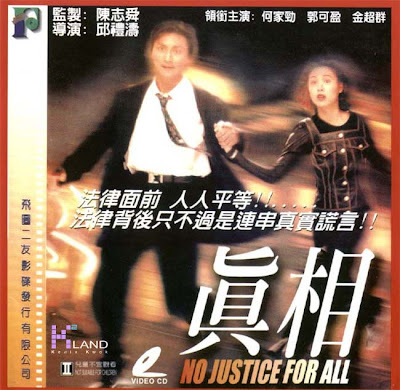 No Justice For All was the very first movie that Kenix made in her early showbiz days. She and Kenny looked very compatible since both have the looks and the talent. This was, and is still a very rare movie that it's almost impossible find it anywhere. I've been looking all over the internet, the video stores, etc... but there was NO WAY that I could find it. Luck only started to smile with me "YAY!" when a fan uploaded the movie online for others to watch. Many fans were THRILLED because we really thought that we would never get a chance to watch this early work of Kenix. I was especially disappointed because I would love to watch Kenix and Kenny as a couple. 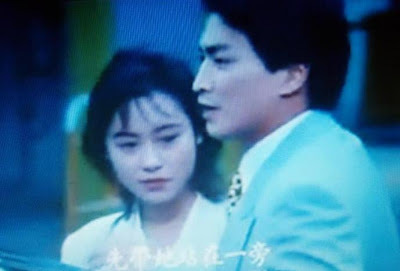 Who wouldn't love Kenny as Zhan Zhao in the Taiwanese/ATV classic Judge Pao? Perhaps due to the tremendous popularity of the Judge Pao series, NJFA is like a movie version of it. It reunites the main casts of Judge Pao with Kenix's story being "the case." The story starts when Kenny, being a talented lawyer, just wins a case in the court. He's eating in a restaurant with a colleague to celebrate and meets Kenix there. She introduces herself as a hairstylist and gives him her business card. He then goes to the salon to have his hair done. While Kenix is doing his hair, she receives a phone call from her brother who needs her to bail him out from the police station. He and another friend go to a convenient store and the cashier is not there to check them out. Suddenly, a man comes out from the back of the store with blood all over his body and falls dead on the floor. These two boys are too scared that they run out of the store and bump into a few CIDs who are on their way in. The police see the dead body and understandbly assume that the boys must have done something. They chase after the two boys and only Kenix's brother is caught. In the police station, the CIDs interrogate the boy and conclude that he's the murderer. Without the boy's confession, they start to beat him up (I guess this happened back then) until he admits the crime. The whole interrogation process takes hours and finally the boy gives in to the brutality and comes near the window. Pardon my memory on this part because I have seen this movie quite a while ago. I think the police push him out the window and threaten to throw him down if he doesn't admit the crime but he ends up falling down anyway. This part seems unrealistic because it's hard to believe that the police, even back then, would go to such extent to crave out a confession. Nevertheless, the boy is dead and fortunately, there are two people who witness the whole scene. One is a very young school boy who is about six or seven years old, and the other one appears to be a resigned policeman. There is also an evidence because when the brother is about to fall down, he is too terrified that he grabs on to a CID's necklace. Kenix as a sister comes to the place and sees that her brother is lying dead on the top of a car. When she still hasn't seen her brother's body yet, the school boy pulls her aside and tells her that he has seen the policemen pushing this young man down from high above. Kenix decides to sue those 3 CIDs and hires Kenny to help her with the case. Kenny has recently joined a law firm and his boss played by Jin Chao Chun (Judge Pao) also agrees to take on the case. As easy as it might seem, the case starts to get real complicated mainly because the lawyer on the opposite side is a filthy talent. First, the police department will not cooperate because they know that revealing the truth about using violence during interrogation will damage the Hong Kong police's reputation. Second, the school boy is unqualified to be a witness because he is too young. The resigned policeman also refuses to appear in court because he fears revenge by the CIDs (this part might be erroneous due to my rusty memory). Kenix and Kenny then have to search for the friend of her brother who is in hiding but that doesn't help either. In addition, the CID with the necklace claims it was lost before this incident happens. In order to make Kenny continue with the case, Kenix lies to him by claiming that she sees the CIDs pushing her brother down with her own eyes. Her testimony is then proven false by the other lawyer due to the inconsistent timing and that she has been diagnosed with mental illness a few years back and thus, her words are not reliable. In the end, the court rules in favor of the CIDs and they walk out the court freely right under the blind-folded Statue of Justice. I guess it's because she's blind-folded ^__*. Overjoyed by the victory, the CID with the necklace walks over to Kenix and whispers in her ear that he did push her brother down and will do it again if given another chance. Enraged by the inequitable verdict, Kenix decides to take the law into her own hands. Taking advantage of the crowded and busy atmosphere, Kenix uses Kenny's car and aims to hit that CID at full speed. As the man is dying on the street with reporters snapping pictures, Kenix contentedly steps out of the car with Kenny running towards her. He asks her if she has gone mad and that she can go to prison for this, she calmly answers him, "Don't you worry. I will tell them that I'm mentally unsound." NJFA is overall a good movie and Kenix's & Kenny's appearances only spice it up. Even though the cause that leads to all this mess is somewhat unreasonable, the court case and the evidences that follow it are properly presented. It does make sense that the police department would not want to lose reputation, that the school boy is too young to testify in court, that the necklace is claimed to have been lost long before the incident, etc... The best part about this movie, of course, is the collaboration of Kenix and Kenny. Both are beautiful actors and both are on my favorite list. Even though their love story is overshadowed by the court case, it still manages to shine. It is because of his feelings for Kenix that Kenny agrees to take on the case and continues with it to the end, even when he knows they will lose. They have many scenes together for the need to discuss the case and thus show sufficient chemistry. Too bad that they only worked together this one time and later went their very separate ways: Kenny in Taiwan and Kenix in Hong Kong, thus leaving no chance for another collaboration. HONG KONG - Cannes best-actor winner Tony Leung Chiu-wai said Monday he hopes to find time this year to wed his longtime girlfriend, Carina Lau, in between promoting his new film and preparing for his next role. Leung and Lau, both based in Hong Kong, are among the Chinese entertainment world's most closely watched couples. "I'm getting up there in age. It's time to consider marriage . . . I'm in my 40s. I can't wait until I'm 60," Leung said as he joked with reporters on the sidelines of a news conference to promote Entertainment Expo Hong Kong, an event to promote the territory's film industry. Leung said that the wedding has been in the works for many years, but that the two have had a difficult time co-ordinating their busy schedules. "Even though the Hong Kong movie industry has gone through a recession, it's still quite vibrant. I'm very busy," he said. "Let's see if we're luckier this year and can find a date. "He said work commitments this year include promoting John Woo's Chinese historical epic "Red Cliff," which he just finished shooting. He'll also prepare for his next role as Bruce Lee's kung fu master, Ip Man, in famed Hong Kong art-house director Wong Kar-wai's planned biopic. Leung is known for playing subdued characters like the melancholy writer who had a love affair with a married woman in "In the Mood for Love." That performance won him best-actor honours at France's Cannes Film Festival in 2000. Kenix is in a white shirt in the front row. It's so nice to see Kenix almost always attending Hacken's concerts to support her good friend. Until this day, I still did not understand how and why the reporters started those rumors about Kenix and Hacken a few years ago. For those who haven't heard of these rumors, it was said that Kenix and Hacken had been secretly dating for about 2-3 years, ever since their last collaboration in the Legal Entanglement series. Allegedly, Hacken's wedding with his current wife Emily had to be postponed due to these speculations. If I remember correctly, during this time, there was not much news about Kenix because she had stopped accepting series from TVB. Then suddenly, I went on the internet one day and read news about her so-called affair with Hacken. I was shocked, not because they were an "item" but because the news seemed to pop out of nowhere. I was talking to my sister that why didn't they start this rumor right after the filming of Legal Entanglement; why now? I also think this was the reason Kenix did not attend Hacken's wedding to avoid causing more speculations. What a pity! If it wasn't for this, I'm sure she would've attended. Anyway, it's nice to see them still being friends after those absurd rumors. In the clip, it's obvious that Hacken was surprised to see Kenix, so I guess she didn't get free tickets from him this time ^___^. Thanks to mtd for the information. Kenix Kwok and Frankie Lam usually appear in a pair. Earlier Kenix was photographed to be celebrating Frankie Lam's birthday in a beautiful atmosphere. But last night Valentines Day, there was no sign of husband Frankie with Kenix. In contrast,there were 2 other female good friends accompanying Kenix for a meal in Central District. Although her husband wasn't there, but Kenix was still in a good mood. When she noticed reporters taking pictures of her, even turned around and smiled for pictures, she wasn't mad at all that she was being followed. As Kenix was in Mainland and received a bush of beautiful blue flowers, she was asked if her husband send it to her? She immediately smiles and only said: "Happy New Year!" as she got into her car. Kenix was in mainland earlier without Frankie? I thought she went there with him, along with Cheng Ming Ming? I thought they were visiting some poor place there with the children. Or maybe that was another event.